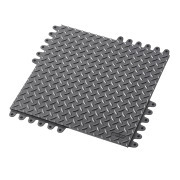 Extremely comfortable heavy duty anti-fatigue matting system with popular diamond plate traction surface that can be easily assembled for coverage of large areas or individual workstation mats. These 45 cm x 45 cm modular rubber tiles are designed with a universal double-locking system on all sides to ensure an extra strong yet seamless connection for fast installation. The 19 mm thick platform insulates the worker from the hard ground while the bulleted domes underneath allow the mat to bend and flex with every movement. Unique extended ramp prevents tripping and allows cart access with smart beveling solutions for inside and outside corners. This freeze protected and insulated shower is intended for use where there is a possibility of the water inside of the shower freezing due to extreme cold climates. It features trace tape heating with polyethylene jacket and polyurethane foam insulation to improve frost protection and strength. AccuFlow™ safety cans combine protection with convenience! Type II AccuFlow™ Steel Safety Cans No Spill Gas Can Go beyond protection and compliance with the added convenience of AccuFlow™ with Safe-Squeeze® trigger for safe and controlled pouring. From dry to wet conditions, light to heavy duty, use this catalogue to choose the right Notrax® mat for the right application. It will contribute to increased productivity, employee satisfaction and fewer injuries. Cable protection & management solutions. The new Justrite EMEA Catalogue 2019. For use in cold climates with a minimum ambient operating temperature of -4°F (-20°C) or above, this range of outdoor emergency safety showers are jacketed and heated to prevent the possibility of the water inside the shower freezing. Models are suitable for use in both Class 1 Division 2 hazardous areas, as well as non-hazardous areas. 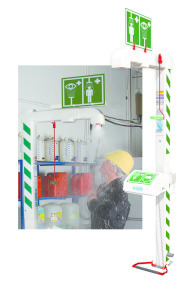 All models include a universal safety shower or eyewash and safety shower sign for enhanced visibility, as well as an inspection tag for recording service and test history. An independent testing organization, FM Approvals, is a globally recognized laboratory which has construction and performance specifications for safety cabinets. They test for load capacity, fire, and spill protection to ensure a product meets their standards. Rigorous testing includes loading a cabinet to capacity for 72 hours and then subjecting it to a ten-minute fire test during which the internal temperature must not exceed 325°F (163°C), and exterior temperatures can reach as high as 1300°F (704°C°). Spill containment is tested by filling the cabinet sump with liquid to a depth of 2 inches (51 millimeters) – it must not show any sign of leakage for at least 24 hours. 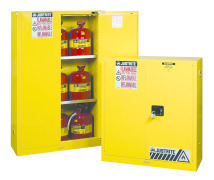 In addition to a fire resistant design and leakproof sump, Sure-Grip® EX safety cabinets have extra safe, extra secure features such as firefighter-friendly Haz-Alert™ reflective warning labels that burst with visibility under fire conditions, a U-Loc™ handle that comes with a key set and accepts an optional padlock for added security, and SpillSlope® shelves that safely direct spills to the back and bottom of the leakproof sump. These safety cabinets are a good investment to reduce fire risks and protect your employees and workplace. Quality is backed by an industry first, 10-year warranty. Rigid-Lock QuickBerm® Lite from Justrite offers 100% leakproof protection against spills from damaged saddle tanks, hydraulic lines, leaky pipes, machinery, batteries, and more. Durable, lightweight and portable, it folds down to fit in trucks, emergency vehicles, and spill kits for on-the-go environmental readiness. 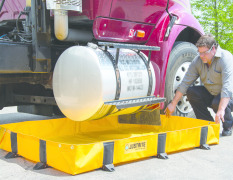 One-piece design sets up fast and easy for emergency spill response. Patented Rigid-Lock wall supports provide strong structural integrity and maximize usable space inside the berm. Black wall support hubs accept anchors to withstand wind loads of up to 40 MPH for reliable containment under high wind conditions. Optional polyethylene grating makes it ideal for use as an emergency decontamination station. 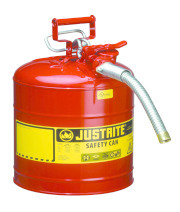 Justrite AccuFlow™ Safety Cans Combine Protection With Convenience! Fully compliant and designed to protect against explosion, Type II AccuFlow™ cans from Justrite® offer optimum convenience when handling flammable fuels and chemicals. Patented manifold with Safe-Squeeze® trigger provides the easiest, fastest, most controlled liquid flow ever. Large ID zone identifies contents to avoid misuse and mishaps, or can be used to denote user or department location. 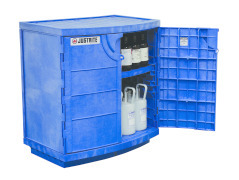 Never worry about corrosion while storing strong acids such as hydrochloric, sulfuric, or nitric acids; or bases such as sodium, potassium, or calcium hydroxide in Justrite’s new, metal-free polyethylene cabinet for corrosives. With a robust design constructed of chemical-resistant, high density polyethylene, it protects against damaging container leaks or vapors when storing harsh chemicals. Versatile in any environment, the cabinet features a recessed kick-toe for improved ergonomics when used under a counter, or use for stand-alone storage and take advantage of top work surface. A spacious interior holds up to 36, 2.5-liter bottles and includes an adjustable shelf. Leakproof sump with a big 8.5-gal capacity features a removable sump cover for easy cleaning of spills, and serves as a bottom shelf for additional storage. For expanding storage needs, stack an additional cabinet on top without taking up additional floor space. Higher risk environments benefit from using EN safety cabinets with a longer fire resistance time, offering increased evacuation time in the event of a fire. These environments include remote locations without quick access to fire-fighting emergency services and high-occupancy sites where evacuation times could be compromised. Special construction allows containers of volatile liquids to remain intact in the event of a fire for up to 90-minutes. This allows more time for personnel evacuation, and gives emergency responders additional critical minutes for controlling the fire before it reaches the flammable contents of the cabinet, greatly reducing the spread and severity of the fire. Other high performance features of an EN cabinet include a hybrid-close door style that automatically closes in the event of a fire, dual vents with butterfly valves that close securely under fire conditions, independent locking doors for security, and a door damper for comfortable operation.